The next step for PV technology is integrating it directly into buildings. Sally Ward-Foxton explores for ES Design magazine. What if a building could generate its own electricity, without the addition of external solar panels? BIPV (Building Integrated PV) is the idea of integrating PV materials into the fabric of the building itself, rather than installing separate solar panels. These systems replace non-active parts of the building, such as window glass or roof tiles, with modules that can capture energy from the sun. BIPV is a different concept to PV in a lot of ways. In contrast to standard PV solar panels, BIPV modules are dual-purpose – their mechanical function as a construction material complements their electrical function. Generating electrical power from the environment therefore needs to be considered right at the start of the architectural process. Another way that standard PV differs from BIPV is in the technology used. The most commonly used technology behind traditional PV panels today is crystalline silicon, which comes in two flavours: monocrystalline and multicrystalline. Monocrystalline silicon uses wafers cut from a single, very large crystal of silicon, whereas the most common type, multicrystalline, is slightly less efficient but more cost effective. In both cases, the crystalline material is doped and a ‘sandwich’ of n- and p-type materials is created. This single junction is covered with a layer of glass to protect it from the environment. Efficiency for monocrystalline cells is up to 25%, dropping to a maximum of 20.4% for multicrystalline, but low light conditions and high ambient temperatures can negatively affect performance. In direct contrast, most BIPV modules use a 2nd gen PV technology called thin-film. In this technique, a PV material is deposited onto a glass, plastic or metal substrate, in a film that’s between a few nm and tens of μms thick. PV materials that are used for thin-film PV cells include Cadmium Telluride (CdTe) and Copper Indium Gallium Diselenide (CIGS). Because there is so little material involved, the cells are thin to the point of transparent, lightweight and can even be manufactured on mechanically flexible substrates. Other than the material and thickness of the layers, cell structure is similar to crystalline silicon, with n- and p-doped layers forming a junction protected by an encapsulation layer, such as glass. R&D in recent years has brought efficiency up to around 21%, however, some of the materials and manufacturing processes are toxic. Crystalline silicon prices have fallen dramatically in the last few years, so rather than trying to compete, thin-film solar has begun to focus more on niche applications like BIPV where the unique properties of the technology are an advantage. These attributes (mechanical flexibility, light weight and transparency) allow the price differential to be justified in these applications. 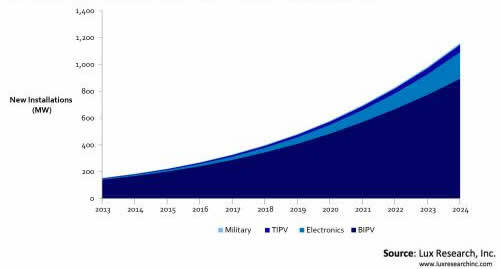 Figure 1 - Niche markets for thin-film PV grow at an 18% CAGR to 1.2GW in 2024 (Source: Lux Research). According to the latest market research from market analysts Lux Research, the total market for new thin-film products in 2024 is 1.2GW, driven primarily by BIPV. Solar roofing products have the most traction in BIPV today, accounting for 425MW (around half the BIPV market), but facade modules will grow faster, reaching 407MW in 2024. A common example of a facade installation of BIPV is the CIS Tower in Manchester. This 118m tall building was retrofitted with BIPV panels in 2004 after its original facade deteriorated due to age. The PV panels generate around 180,000kWh of energy a year (averaging 20kW), which is fed into the National Grid. BIPV on a roof might be exemplified by the installation in Perpignan SNCF Station in the South of France, designed by Belgian architects ISSOL. The station’s roof structure is made of thin-film PV panels; a no-brainer when you consider that Perpignan gets 220 days of sunshine every year. 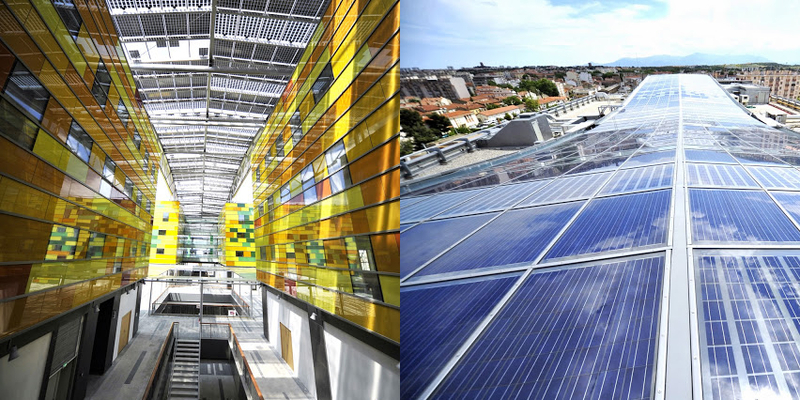 Figure 2 - A BIPV installation in the roof of Perpignan railway station in France, seen from the interior (left) and exterior (right). The world leader in thin-film solar technology for BIPV is Hanergy, which claims its BIPV components have superior low-light performance, high temperature resistance, customisable shapes and colours, stable light transmittance and improved malleability over traditional panels. The company is based in Beijing, China; as the country industrialises, the applicable area for BIPV in China’s urban areas is expected to reach 1.79bn square metres in the next five years, with an estimated electricity generation of 61.5bn kWh. According to Hanergy, if BIPV can fill all these square metres, it will lead to the reduction in carbon dioxide emissions of 52m tons, equivalent to planting 2.9bn trees or offsetting the exhaust emissions of 16m cars. Figure 3 - A new BIPV facade at Hanergy HQ in Beijing, China. This facade, designed to resemble dragon scales, generates about 20% of the total energy used by the building. 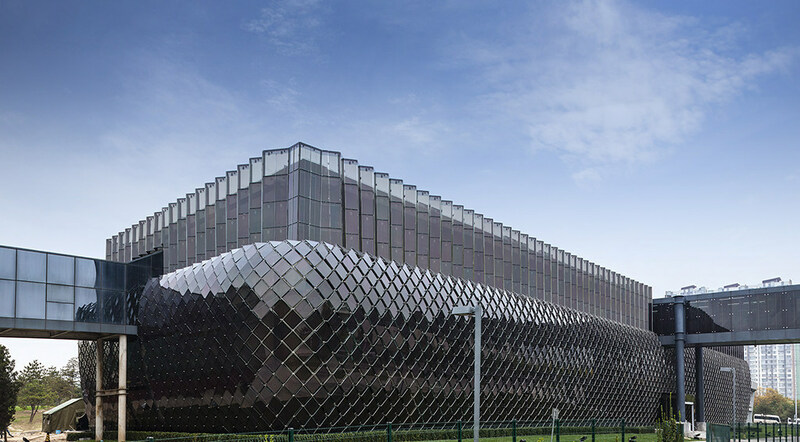 Hanergy recently completed the first phase of a project to cover its Beijing HQ in BIPV modules that look like dragon scales, with a generation capacity of 600kW, which is 20% of the electricity demand of the building. These thin-film PV ‘scales’ have different shapes, colours and light transmittance rates, maximising visual impact. When complete, the installation capacity will equal the energy demand of the building (3MW), using BIPV in curtain-walls, skywalks, flexible roof installations and a carport. A special type of organic thin-film photovoltaic material has been developed by Heliatek in Dresden, Germany. This material uses oligomers (small molecules), building on the success of oligomers in the OLED industry. The company claims its materials are higher efficiency and longer lifetime than PV materials based on printed polymers (long molecules). Heliatek’s world record is just 12% efficiency for its solar cells, but the company says its organic materials perform better in low light and at high temperatures than crystalline silicon and thin-film PV. Figure 4 - Heliatek’s organic PV devices use a tandem cell, which allows absorption of a broad spectrum, thanks to the two different materials. Heliatek devices use tandem cells (two cells stacked on top of each other). The cells use different materials which absorb at different wavelengths, making it possible to absorb energy from a broad spectrum using devices as thin as 500nm. 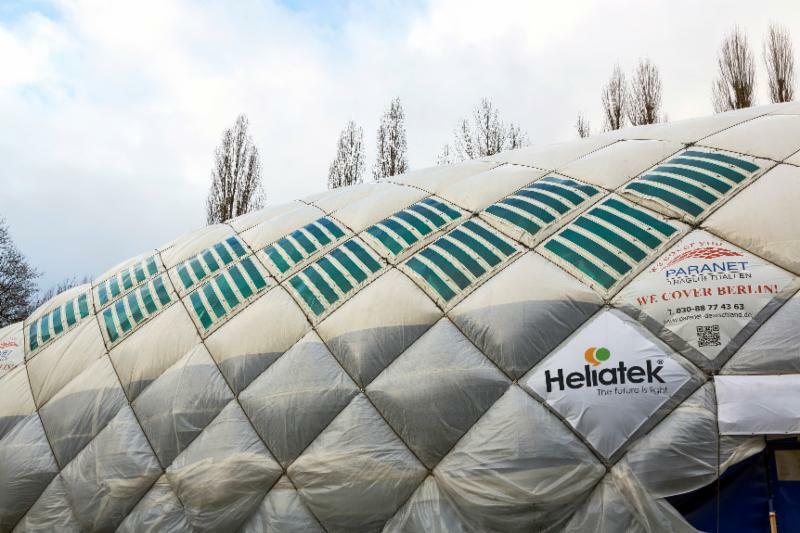 A recent test application of Heliatek’s technology placed its organic solar cells on the PVC membrane of an airdome in Berlin. These domes are used for sport, events or emergency accommodation but they are notoriously energy-hungry, requiring big fans. This test project used 2x2m squares for a total coverage of 50m2, and produced 1.4kW peak of energy, which is 5% of the energy demand of the dome. Heliatek, along with the dome’s manufacturer, Paranet, expect to be able to create domes that are energy self-sufficient by 2016. They plan to extend the PV material to cover a quarter of the available surface and add an energy storage and control system. 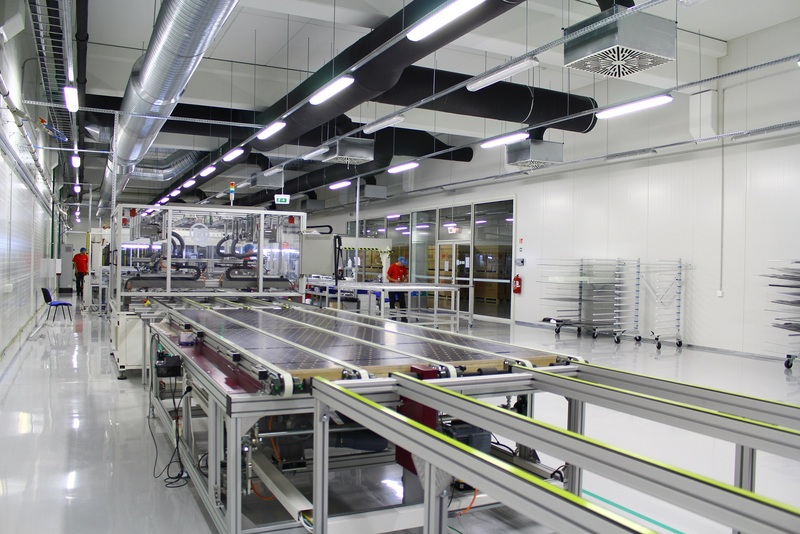 Also expected to be up and running in the near future is the EU-sponsored SmartFlex project, which involves the building of a production line for PV facade modules in Vilinus, Lithuania. Since architects often find that their BIPV designs for facade elements are either technically impossible or too expensive to be implemented, the project includes specially-created design software used to design BIPV modules in a variety of shapes and colours, with the data sent directly to the production line. Initiatives like the SmartFlex project are making BIPV easier for architects to specify, while the development of new PV materials by companies like Heliatek is pushing the science forward. Someday all built structures may be able to produce their own electricity, but in the mean time, BIPV projects are providing significant amounts of renewable energy for consumers, offices and industries. Figure 6 - The production line at the SmartFlex project in Vilinus, Lithuania.